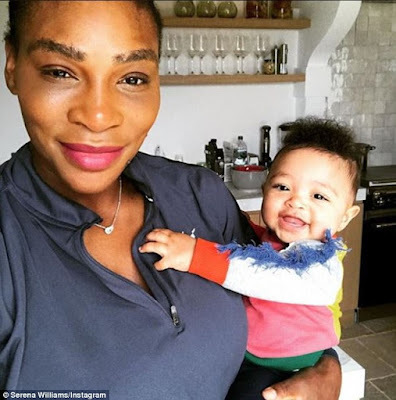 Serena Williams said she 'cried' because she missed a major milestone in her baby girl's life because she had to work. 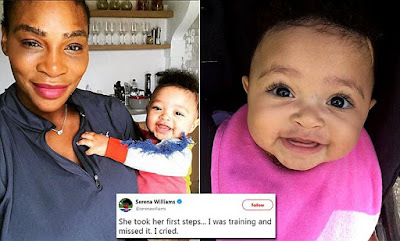 The tennis champ, who advanced to the fourth round at Wimbledon on Friday, revealed in a Twitter post hours after the game that while she was in training her 10-month-old daughter Olympia was taking her first steps. 'She took her first steps ... I was training and missed it. I cried,' Williams posted. Before Williams took the victory at Wimbledon on Friday, the superstar tennis player and married mother-of-one tended to her adorable baby girl Olympia. 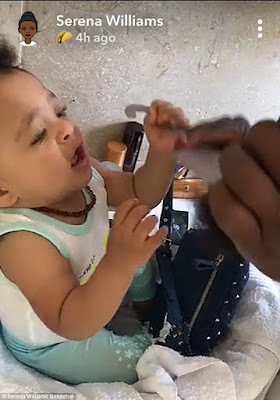 Williams took to Snapchat moments before walking out on Center Court to share a few sweet videos of 10-month-old Olympia 'helping' her mom get ready for the big game in the Wimbledon bathroom.